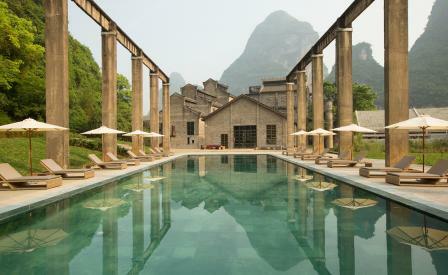 While China is not exactly short of a good hotel these days, we can think of at least two reasons to visit Alila Yangshuo. First, is its heritage home within a disused sugar mill and second, is its flawless location – an hour south from the well-worn tourist paths of Guilin– in a remarkably serene slice of countryside. Embraced by the curve of the Li River, among the region’s dramatic tableau of soaring mountains, deep river-cut valleys and antique villages, the cluster of 1960s buildings have been rescued, restored and revived by Beijing-based Vector Architects and interior firm Horizontal Space Design into a total knockout: a series of lofty public spaces and 177 suites unravel over original brickwork, subtly lit exposed beams and an understated new build that slots seamlessly into its surroundings. Here, perforated cement screens cast a dappled light onto a clean, tactile interior of recycled timber and a mix of contemporary furnishings – mostly by Chinese designers – from low-slung leather benches by Shanghai-based Maxmarko to PINWU Studio’s layered rice paper and beech wood bucket chairs and colourful paint-splattered coffee tables. Once a sleepy fishing village, visitors these days come to Yangshuo to explore the wooded glens, rock climb or to simply gaze up at the impressive surrounding peaks. At Alila this is all done in between indulging at the subterranean spa, inspired by the region’s caves, where traditional treatments use ingredients such as local black sugar; grazing on the expertly prepared Chinese and western offerings at Sugar House Restaurant; or sipping on poolside rum cocktails – straight from the hotel’s own distillery – against an evocative backdrop of bamboo-swathed hills and a speckle of cormorant fishermen drifting silently along the meandering river.